I don’t either:>) Thanks for stopping by and commenting. I will send you a pic of my husband in his housecoat at “HIS” place at the kitchen counter where he sits for hours on end, escaping to another world after work every evening without fail. he reads two or three books each week. i don’t see how he does it. Sorry, Patti – don’t have any pics of me for either of those. I’m usually the picture taker, not the subject! Feel free to use comment, though. Thank you, Susan..okay to add part of this to Mon post? Susan, my husband and I also read ‘the good parts’ to each other. And, at holiday time, he reads A Child’s Christmas in Wales (D. Thomas) at the annual family gathering. Wonderful way to bond and share. Think we’ve created a tradition with our kids and grandkids. I have never been able to read in bed. my son hides in the bathroom to read…lol my hubby reads on the couch and I like to read outside or in bed..I cant wait to hold your book in my hands with a cup of coffee and sit outside and read it. 🙂 along with a big box of kleenex. well Ive been trying to get him to come to the office to look at the computer….but he has been in his “office” reading ..LOL This boy like his dad devour books, like you many of the woman in our family. Glad I could oblige…did you show him he was on FB too? I mostly read on vacation – or when I’m not writing, it can also be called. I read on the sofa. My husband and I have a date-nap day and read fairytales to each other. It’s amazing the number of adults who can’t read. I used to volunteer ‘Each One Teach One’ tutoring adults to read. Most of them wanted to be able to read a story to their young childrn. I agree it is sad. I used to teach ESL- English as a 2nd language at my college. I taught adults who were trying to take the basic classes. I would have KILLED for a treehouse when I was a kid. A place to read, a place to dream … and the ultimate place to escape. I know. Mom & I were lucky to be there (AZ) when they built it. And he’s such a reader! Love the tree house and the fact that it’s an inspiring place to read. Boys seem to be more reluctant readers than girls, but I think e-readers play their part in encouraging them, as they tend to be into electronics. I have a pic of my daughter reading on top of a big snow mound in Bulgaria if you’d like it? Graeson has a reader, but he likes books better. I would love to have that pic for Monday! What fabulous photos! 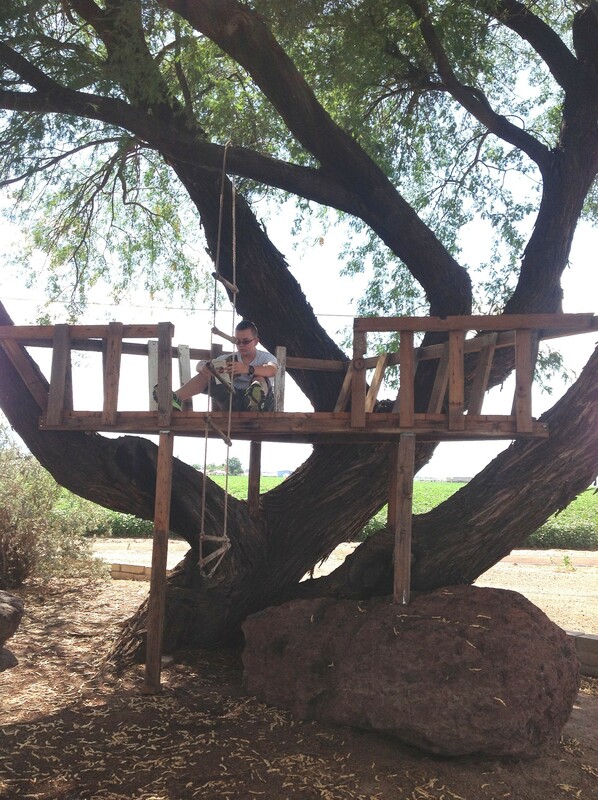 The tree house! And the bed nook! I like to read by lying on the couch, propped up on pillows, a tote bag full of books and reading material on the floor at my side. I’d like one of those magical places like you show above! Send me a reading pic if you can for Mon post. People are really responding to this! happy to add links to sites too. Hahaha, of me lying on the couch? That might break my camera ;). 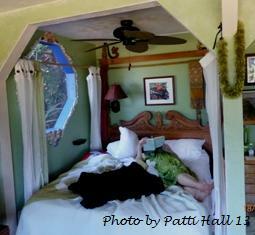 I will try to beg someone . . . .
Patti, love this post. Love that tree house and like others, wish I had one now. When I was a kids, the tree at the end of the gravel driveway next to our white frame house has a rope swing. I remember with great fondness sitting there, reading a Nancy Drew mystery on a sweltering hot rust belt summer day–humidity seemed to just ooze through the ground. Gasping for breath both from Nancy’s adventure (oh my….. what else could possibly happen) to feeling I’d absolutely melt from the heat before a breeze came wafting by. At a family reunion last weekend, my niece showed the award winning book by her first grade daughter (she’s in the young author’s program at her school). It was filled with great narrative and drawings of last year’s gathering–it also pointed out how much our family likes to talk, talk talk and eat, eat, eat! That’s what she wrote! Loved it. Judy, I don’t see my reply to you…will look some more, as I know that I responded, will respond again if I don’t find it. Great! We love people who celebrate reading! Whether up a tree or on a bed reading takes you places other media cannot reach! I agree and thank you for stopping in.